Copper sulphate offered by us is an odorless blue crystal which readily dissolves in water. 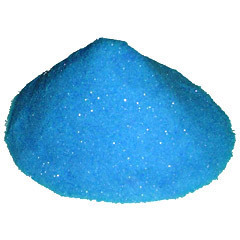 Copper sulphate is also has good solubility in methanol, glycerol and has small solubility in ethanol. Copper sulphate powder is a foremost dietary supplement in all animal feeds. Its brilliant absorbent properties make it suitable for destroying algae in water supplies. Fine crystals copper sulphate can be used as an ingredient in bordeaux mixture sprays as a fungicide to control plant diseases. It is used as an ingredient in wood treating chemicals to protect against mildew and rotting. 2013-14 Rs. 25-50 Crore Approx. 2012-13 Rs. 10-25 Crore Approx. Since our inception in 1967, our company leverages on its four decades of rich experience in the industry and caters to the needs of chemicals, pharmaceutical, feed and other industries. We are backed by strong technical know how regarding safe handling of cyanide and various others critical chemicals. We are the first to use cyanides on commercial scale in india. For utmost customer satisfaction, we package our range of inorganic chemicals as per the specific needs of our clients. Our range of industrial inorganic chemicals includes zinc sulphate hepta, zinc sulphate mono hydrate, silver cyanide, silver sulphate, silver iodide, palladium chloride, potassium iodide etc.